Most of the world knew him as the chairman and chief executive of Korean Air. The chairman — that’s what pretty much everyone called him — was an incredible listener if not a voluble talker. When he did talk, he could be very, very funny. He could read people, and brilliantly. He was decisive. He was an expert photographer and the arrival of his annual calendar — world-class pictures he had taken from around the world — was itself an event, the calendar then a daily reminder of the connections he had forged. He demanded, but also gave, loyalty and trust, and when you had earned his trust it was earned for all time. Now, regrettably, his time has come to an abrupt end, and it seems impossible. During the 17 years that I worked as a staff writer at the Los Angeles Times, I wrote — as we all did — obituaries. Obituaries of that sort, of the kind I have read in mainstream outlets for the chairman, and I have by now read several, have necessarily referred to various controversies, as any editor would insist. To begin, no one is perfect. Anyone in public life finds critics. The obituaries read the way they do because certain facts are what they are and, moreover, mainstream journalistic convention demands it. That is, not just the reporting of certain facts but the emotional compartmentalization of the person doing the writing — which, hazarding a guess, in the case of the chairman was probably straightforward enough, odds being very good that most if not all of those writing about him had never met the man. Or had any meaningful interaction. This is not an obituary. This is an appreciation. At Korean Air, he took over as chairman and CEO in 1999. He oversaw far-reaching corporate culture change in the aftermath of awful disasters, including the crash in Guam in 1997 of KAL 801, which killed 223 people, an episode that Malcolm Gladwell explored at length in the 2008 bestseller Outliers. As Forbes has reported, the chairman drove revenue from under $2 billion to $12.65 billion in 2018; saw the KAL fleet double; destinations triple; and positioned the airline as a global player as a founding member of the Skyteam alliance. The chairman loved the airline. He also loved the University of Southern California, where he and his children earned degrees (his, MBA, 1979). Also earning USC degrees: his two brothers, sister and a cousin. He would serve for 22 years on the university’s board of trustees. For the past eight years, I have taught at USC, at the journalism school. Inevitably, when we talked, he would say to me — fight on. The chairman loved Los Angeles. In one of his last major projects, he built the Wilshire Grand Center, a hotel-and-office project intended to underscore Korean influence in LA and throughout the Pacific Rim. The $1.35 billion structure, adorned with the Korean Air logo, is not only LA’s tallest skyscraper, more than 1,100 feet tall, but — as well — became when topped out in September 2016 the tallest building west of the Mississippi River. When you fly into LA, especially from the north or west, you typically fly around downtown before turning west toward LAX. That path takes you right by the Wilshire Grand. He used to love telling a story about how he visited LA on his honeymoon. It was 1974. He and his new bride got lost wandering around the streets downtown. The scene was keyed to industrial strength, like sets from a movie — dark, lonely, no place to be out and about. The Times’ offices were downtown. Believe me: I would come to know. The chairman always loved telling this detail: he could never find anyone to offer direction to the hotel he and his wife were supposed to go to. Now downtown LA is hipsterville, and the corner the Wilshire Grand sits on is one of the key pieces of its revitalization. The chairman also loved sport — especially how it could frame the dreams and be the inspiration for young people — and he loved his country. 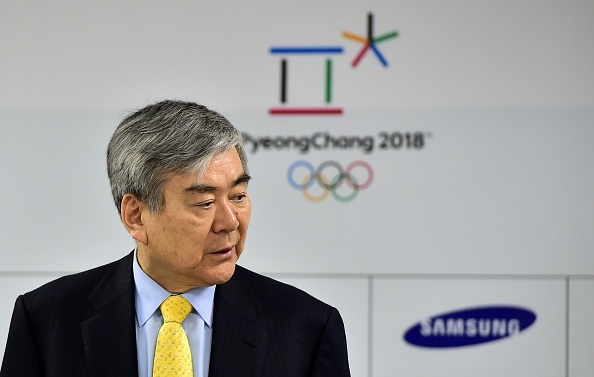 To this point, it’s not overstating things to say that the PyeongChang Olympics happened in 2018 because of the chairman’s leadership. No bid is ever the work of one person. It does, in fact, take a team. PyeongChang had bid for 2014 and lost (to Sochi); and for 2010, and lost (to Vancouver). There were many differences in the 2011 campaign that won for 2018 — Terrence Burns’ strategy and its implementation, the presentation content and management; Theresa Rah’s brilliant on-stage presence; the steady hands of Yong Soon Kim and Muchol Shin; the drive of John Moon and Y.S. Park from the Korean Olympic Committee; the gracious input of Gov. Jin Sun Kim; and the work of Charlie Battle, Erskine McCullough, Luciano Barra, Stratos Safioleas, Laszlo Vajda, Mike Lee, Caroline Rowland, Lou Lauria, Ansley O’Neal, and many, many others (apologies, please, and a plea for understanding to all those not named). All the same, the chairman was arguably the key. Unlike the 2014 and 2010 bids, which featured — to generalize here — a cadre of chain-smoking Korean men in blue or black suits moving in seemingly synchronized fluidity to and from appointments, the chairman stood apart. He was the living symbol of a bridge between east and west, fluent in sport, politics, diplomacy, business, whatever. Five years ago, Burns published to the internet a tremendous, lengthy, four-part review of how PyeongChang won; you have to remember that PC was competing in 2011 against Annecy, in France, along with Munich, and spearheading the Munich bid was no less than Thomas Bach, who in 2013 would go on to become IOC president. “Good,” the chairman said, adding, “That’s you and me.” And then he hung up. “YH didn’t waste words,” Burns writes. PyeongChang won the 2018 race going away. Annecy was eliminated in the first round. In the second, PC got 63 votes, Munich 25. After winning, the chairman went back to Korean Air. But then, his country called again and in August 2014 asked him to serve as organizing committee president. At a test event at the alpine center in 2016, it was awesome to see the chairman roaring up the super-steep hill on a snowmobile. Like, really ripping it. And obviously having a great time. He resigned the organizing committee presidency in May 2016. It later turned out that Soon Sil Choi, adviser to the country’s then-president, Geun Hye Park, had played “undue influence” in forcing the chairman out. For more than 10 years, meanwhile, the chairman was also president of the Korean Table Tennis Association. In February 2018, as the Games were wrapping up, the chairman organized a lunch for some key members of the bid team. He invited me as well, a journalist interloper. People who knew the chairman wanted to be around him. It was that simple. We all just wish there had been more time. Note: Korean Air buys advertising on this website. It did not play any role in this story nor has it ever played any editorial role in any story on this site.